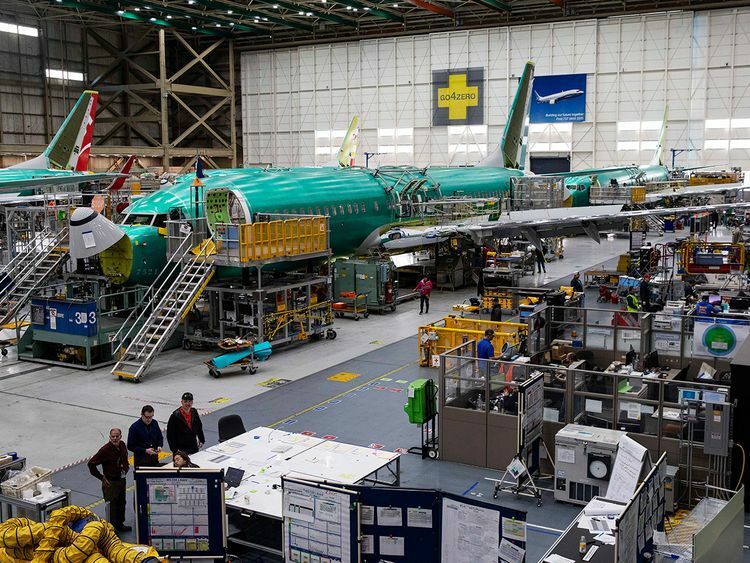 CHICAGO/SEATTLE: Boeing Co. is cutting production of its 737 jetliner for the first time since the September 11 attacks as the plane maker works to limit financial damage from the global grounding of its newest and best-selling aircraft model. By slashing output 19 per cent — to 42 aeroplanes a month by mid-April — Boeing will be able to reduce its spending on the 737 and preserve cash. As work slows in a Boeing factory south of Seattle, two key suppliers, CFM International and Spirit AeroSystems Holdings Inc., indicated they would continue full-tilt at the current record pace. Even at the slower production pace, Boeing faces about $3.6 billion (Dh13.2 billion) in quarterly losses, said George Ferguson, an analyst with Bloomberg Intelligence. As it continues to build planes, the company is foregoing payments from customers who aren’t able to take delivery because of the grounding. Maintaining the status quo will “help ensure the stability of the global CFM supply chain,” Jamie Jewell, a CFM spokeswoman, said in a statement. Spirit AeroSystems, which makes the fuselages for the Max, said it plans to store the 737 fuselages and other components around its factories. ‘This staggered production approach allows us and our supply base to better prepare for and support 737 production,’ said CEO Tom Gentile. Boeing shares fell 2.4 per cent to $382.69 in after-hours trading. The stock has declined 7.2 per cent since the March 10 Ethiopian crash, the second-worst performance among the 30-member Dow Jones Industrial Average. Spirit Aero fell 1.9 per cent to $87.97. The plane maker doesn’t rule out further cuts to production if the grounding proves to be lengthy. “We’ll continue to assess our production plan,” Boeing spokesman Chaz Bickers said. If regulators take their time in certifying the Max’s return to the skies, Boeing would be forced to stash hundreds of factory-fresh jets in airports across the Western US until commercial flights resume. As of Friday, there were 21 of the jets stored at Paine Field north of Seattle, according to 737 production blogger Chris Edwards, and eight at Boeing Field to the city’s south. A swift return to normal looks increasingly unlikely for the Max and Boeing. Engineers are still finishing work on a software update for a stall-prevention system linked to a Lion Air crash in October and the fatal dive of an Ethiopian Airlines plane near Addis Ababa last month. Muilenburg on Friday said he asked Boeing directors to establish a committee to review “companywide policies and processes for the design and development of the aeroplanes we build.” The group, chaired by Retired Admiral Edmund Giambastiani Jr., will study the safety of the 737 Max and other programs and recommend improvements. Boeing said April 1 that it would be several weeks before the software patch for the Max is submitted to regulators. The US. Federal Aviation Administration vowed a rigorous review, while authorities in Europe, Canada and China plan to do their own analysis.